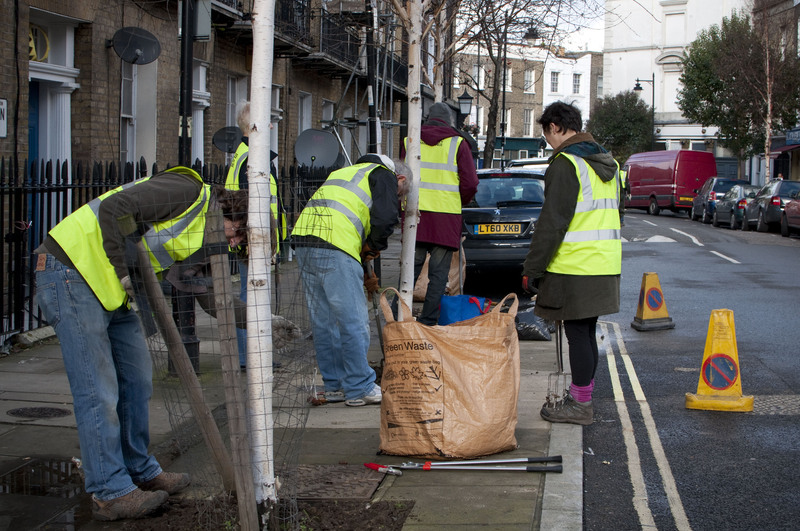 Environment and arts charity King’s Cross Community Projects ran their first street tree maintenance day on Sunday 19 January where they were joined by volunteers from the local community. They covered the north east quarter of King’s Cross. The staff at locally based international asset management company E C Harris were thanked for their donation part of which was used to buy tools for the day. Plans are afoot for a spring tree pit planting day and the group will once again work closely with the award winning tree team at Islington Council who they thanked in a short film they’ve produced about the day. We’ll report on volunteering opportunities with King’s Cross Community Projects shortly, updates are also available on their Facebook page and via their Twitter account. Below is a short film telling the story of the day (if you can’t see the film below, click this link to see it on YouTube). This entry was posted in Community groups, Community stuff, Green spaces, Wildlife and Nature and tagged Community, King's Cross Community Projects, street trees, volunteering. Bookmark the permalink. That looks like Killick Street they are cleaning up, richly deserved, people throw all kinds of rubbish into the basements of the houses along there, I have even seen dirty nappies balanced on the chicken wire that residents use to protect themselves! Well done!